‘These intervals are designed to take you well into your anaerobic zones (dark side) and to improve your cardio-muscular-respiratory fitness. Basically it is as close to a competitive race as you can get in the midweek office routine and I was quickly impressed by the competition (I came second to a guy that had just done the ‘Fight Club’ before mine…enough said). But as it is called ‘Fight Club’ before I explain the perimeters of the session, a few rules are in order (I swear I will just do this once)…..
1st RULE: You do not talk about FIGHT CLUB….more likely you will arrive broken at mid week office drinks and quite frankly explaining the fierce competition a few blocks down the road isn’t worth the effort. 2nd RULE: You should probably mention FIGHT CLUB to that cycling buddy of yours before he gets left behind on your weekend rides. 3nd RULE: If someone says “stop” or wants to tap out, the ‘fight’ will be continued. The legs are still moving right, they are fine. 4th RULE: You are not there to fight one guy. If a rider is streaking ahead, the question is why aren’t you on their tail? 6th RULE: Always keep lycra and bike shoes in your work bag…..you never know when you need a bit of an escape…. 7th RULE: Fights will go on as long as they have to (Don’t need to alter that one). 8th RULE: Not convinced by the benefits of Athlete Lab (maybe you have seen the news about a new lab in London this coming January 2014 in fact) well your first night at the club should be FIGHT CLUB. Trust me you will HAVE to fight. So the session details, well this is the display held out in front of us today, and because of it being an ‘off session’ in Singapore this is a casual, ‘easy’ profile for us riders. A little grin no doubt came up on the trainers face when I said – ‘This is meant to be tougher?’ (I threw up pretty soon after the conclusion of the nights proceedings!). The idea is usually to stay in the green, however you may find yourself racing the rider next to you. Where would we be without a little competition? No doubt the picture is cloudy because of the tough humidity (atmosphere of pain really). I make no excuses for that. 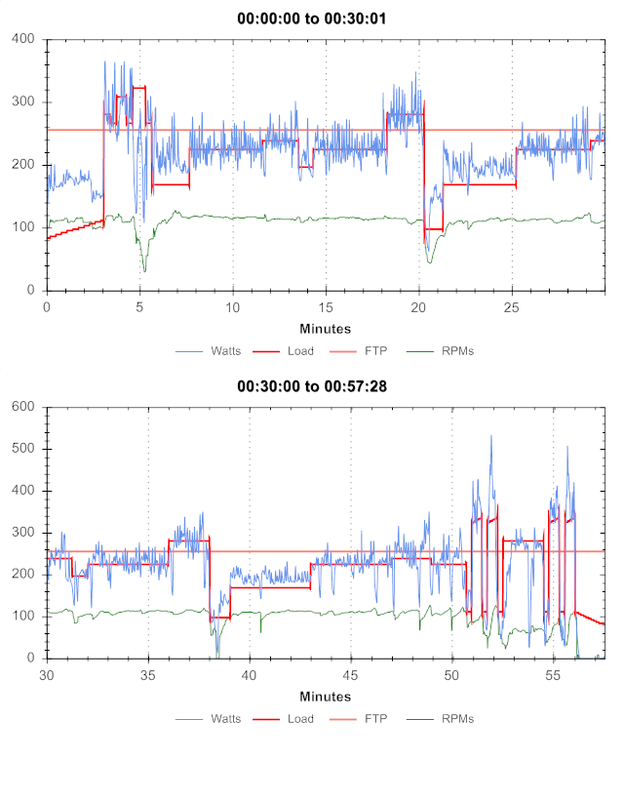 The intervals typically peak at 115% of your FTP, with the slope building from 80%. 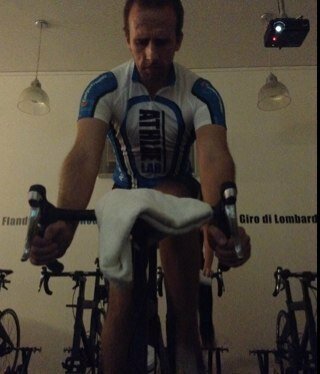 My average over the hour was 221 watts, a figure which no doubt was helped/suffered from busts of interval sprints. Each rider features in one of the boxes above and in this format I was typically watching out for a rider with a greater average wattage. 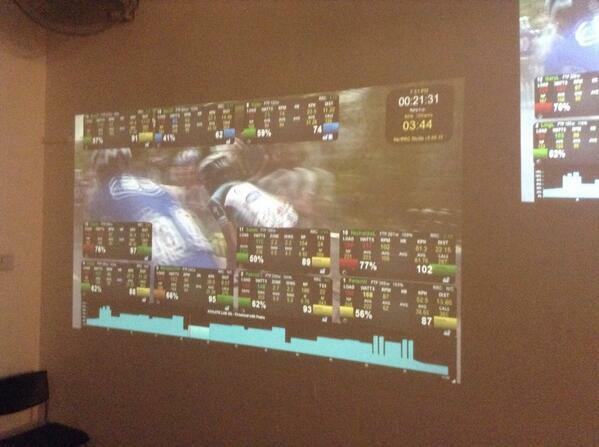 The other figures include heart rate (if you have a monitor), speed, distance and the right hard bar is your RPM. 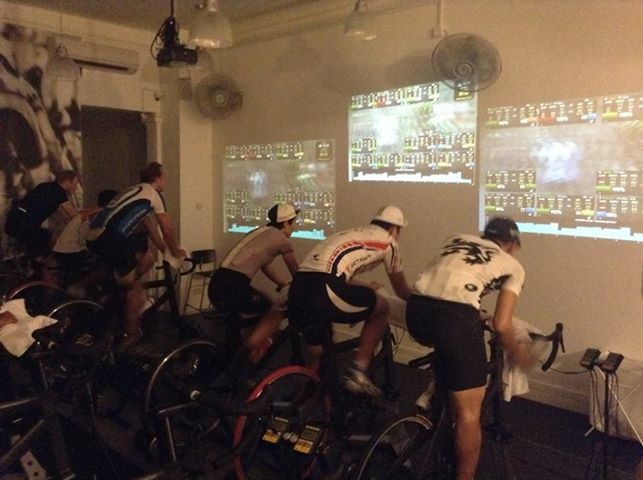 The training program will bark commands on the screen (along with the trainers, although the riders are typically pushing themselves to the max so this is NOT like an annoying spin class were the instructor is consistently talking!) like increase cadence or get ready for a jump in effort. At the end of the session you are automatically emailed a profile (alongside other details) of your workout so you can monitor your progress; such as below. Oh and the video tonight was Alp d’Huez from TdF 2013….lovely scenery to distract you…..I suppose…..
Quite a lot of pain at the end you will note. FTP had been at 256 now is hovering up over 280….maybe put a handy 300 up next session? So that’s a brief run through on the ‘Fight Club’ session. If you have any further questions drop the guys at @AthleteLabSG (on twitter) or via their website – http://singapore.athlete-lab.com/ a line. The lab is based in Singapore, Sydney and in Jan 2014 in London. Otherwise drop me a line on my twitter @NWlongworth. So join us, but make sure you are ready…..I thought I was….